Plantains – not to be confused with the regular yellow “dessert” bananas – are a staple in Latin America, Central Africa, India, Asia, and Caribbean cuisine. When green plantains are cooked, they taste amazingly like a regular white potato. That’s because the starch inside a green-skinned plantain has not turned to sugar yet. Nutritionally speaking, plantains are a rich source of vitamins, minerals and fiber – in fact, they contain more vitamin A, C and potassium than regular bananas. And while green plantains are starchy, they are also very low on the glycemic index – pretty much on par with a sweet potato. For this recipe, you will want to use GREEN PLANTAINS, not the yellow- and black-skinned plantains, which tend to be much more riper and best used for sweetness in main dishes and desserts. These plantains can be the perfect potato-like crispy foil for guacamole or salsa. I hope that you will enjoy them as much as we did! Cut the plantains diagonally into very thin slices. Heat a shallow layer of coconut oil in a cast iron skillet over medium heat.Carefully place the slices in the hot oil . Be sure that you do not overcrowd the skillet. 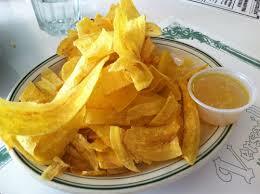 Too many slices of plantain will not allow for even cooking and prevent browning, to achieve a crisp chip. Fry the slices 2 minutes, until golden brown in color. Remove chips, using a spatula, a slotted spoon, or a wire spider. and place on paper towels to drain. SALT IMMEDIATELY after removal from the oil, to assure the salt sticks to the chips. In addition to using salt as a seasoning, also add another seasoning of your choice, such as chipotle powder or paprika, for a change of pace. You can also slice the plantains lengthwise for a variation in presentation.